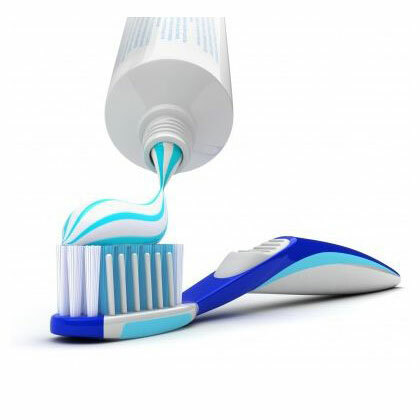 Toothpaste is used for cleaning and removing stains from teeth, freshen breath and remove dental plaque. The term toothpaste refers to a preparation of pasty consistency, white or with coloured stripes, while gel toothpaste is always coloured. The components and their respective proportions may vary depending on the manufacturer. Depending on the type of product to be offered, it is possible to include bactericides, whiteners, small percentages of fluoride, etc. The manufacturing process starts with the activation of the agitators on the main tank, setting the anchor speed to 30 rpm and the central blades to 50 rpm; this needs to be done before loading the components. The loading of ingredients starts with the addition of water and, later, of sorbitol by means of a pump or by vacuum suction. The mixture is performed for approximately 45 minutes, the first 15 minutes it is done with the tank bottom mixer turned on. The agitation speed is then increased by setting the anchor speed to 40 rpm and the central blades to 80 rpm, and the tank bottom mixer is turned on again. The tank is placed under vacuum, automatically maintaining a constant pressure of between 2 and 3 mbar. The solid products (colloidal kaolin, titanium oxide, calcium carbonate) are subsequently vacuum-fed through the bottom of the tank inlet, from the lowest to the highest volume. This feeding must be done very slowly in order to avoid lumps in the mixture, and, in addition, to provide enough time to ensure good absorption and wetting of the product. The tank bottom mixer is stopped when the product achieves certain viscosity. Once all of the solid components have been loaded, the speed of the two agitators is reduced to the speed indicated at the starting, and this speed maintained for approximately one hour. Then, the rest of the liquids is loaded and they are mixed for 20 minuutes. Finally, vacuum is turned off and the perfume and other additives are loaded and mixed for some 10 minutes. Finally, the agitators are stopped and a sample is taken for product quality control. The end product is discharged by means of a progressive cavity Kiber pump. INOXPA offers a mono-block skid, the MIX-5, to produce this kind of product. This skid consists of a main tank with two counter-rotating agitators, an anchor-type agitator with blades and scrapers, and a centrally-mounted blade-type agitator. 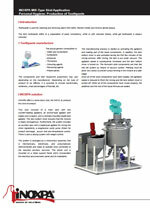 The tank bottom mixer ensures that the mixture is totally homogenous. 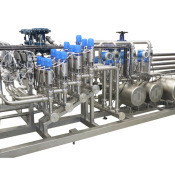 Furthermore, the system includes an auxiliary tank with a blade-type agitator for mixing the minor ingredients, a progressive cavity pump (Kiber) for product discharge, acuum skid and temperature control. There is also a dosing system with weight control.